In modern worship, Saraswati’s origins as a river deity have been obscured. She is a deity of wisdom, and a patroness of learning and the arts. Modern commenters sometimes derive her name from Sanskrit Sāra and Sva, meaning of “essence of self-knowledge”. While not a historically valid etymology, it certainly captures Lady Saraswati’s character. 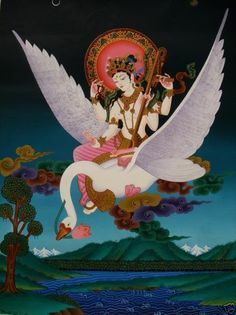 Saraswati Devi’s worship can be traced back to the early Vedic era in India (ca.1500 BCE), when she was honored in the form of a sacred river of the same name. Long ago, the Vedic sages performed their rituals on Her banks. Hymns in the Rig Veda extol Her might, as Her waters could break the backs of mountains (1). The river itself may be long gone, and the facts of its existence have become the source of much controversy,* but Saraswati remains. *Yes, it’s Wikipedia, but it’s a good overview of the scholarly debates on the subject. So bite me. My Lady Saraswati began her life as a river. The Saraswati River was a sacred ford in Vedic times, famous for the might of its rushing waters. My Lady is insistent that she was not some detached river spirit; she was the river. She and the river’s waters were one. Vedic sages petitioned the river itself, hoping that their words would come unbound and flowing, like the waters of the Saraswati, on whose banks they performed their rites.